Kelli has been doing a great job for us here at Headhunters for the past couple years and she will do a great job for you too. If you are traveling this summer to the Mo and end boat lunches for the day, or are wade fishing and want to pack along a great lunch, call Kelli! 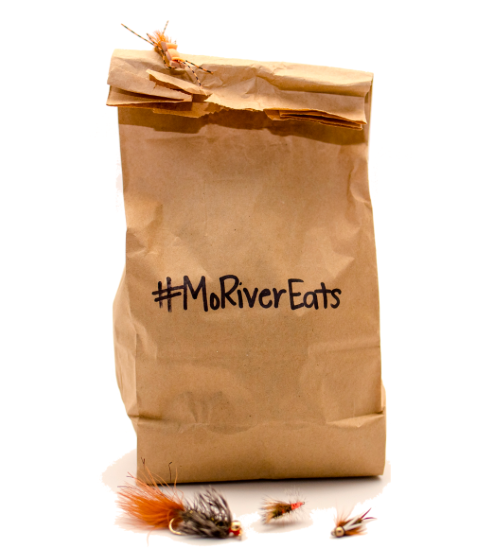 Need river lunches? Traveling to the Missouri for the week, the weekend, the day. Give Kelli a shout @ Mo River Eats. Check out the menu below. We really enjoy the convenience as well as the pricing. Thanks Kelli! We love our lunches! P.S. Kelli bakes the best damn cookies on the planet. No kidding. Available for Call Ahead Only. 406-217-2321. Orders need to be placed by 9pm the night before. Twisting the classic Caesar Salad up a bit by serving it on a crusty ciabatta roll. Our chicken is roasted and topped with crispy bacon and Parmesan cheese over a small bed of romaine lettuce. Served with Caesar dressing on the side. Layers of pesto, provolone cheese, salami, ham, mozzarella, pepperoni, roasted red peppers, and a balsamic reduction are pressed in the middle of a crusty ciabatta roll… a guide’s favorite. Artisan bread is hollowed out to make room for shaved turkey breast over mild cheddar cheese and a delicious spread of our house made raspberry honey mustard. We also add thinly sliced red onion and baby spinach to round off this hearty sandwich. Stacks of veggies on top of a base layer of hummus. Sprinkled with Feta cheese- take it as a wrap or sandwich. Check Kelli and her Mo River Eats out!